Do you live in a state like sunny Southern California where Advantek Pet’s headquarters are housed? If you do, then you are probably doing everything you can to keep you and your pets cool this summer. Advantek Pet wants to make pet owners aware of asphalt conditions during summer heat waves and what you can do to keep your pets safe. As excited as your pets are to go for walks, asphalt reaches temperatures that are just too hot for your pet’s delicate paws. When the temperature is a warm 77°, asphalt temperatures have been measured to reach 125°. A significant amount of damage can occur to your pet’s skin within 60 seconds at this temperature. When the ground’s temperature increases by 10 degrees, hitting a sizzling 135°, when exterior temperatures are 86°. 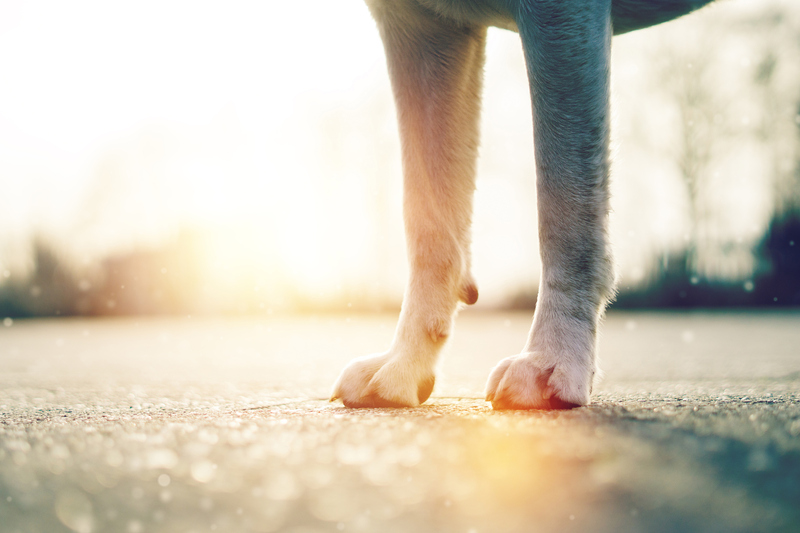 The pavement can reach 143° when it is 87° or hotter outdoors, reminding us of the importance of keeping your pet’s paws off the pavement during peak temperatures. At 131°F, an egg can fry in 5 minutes, which means severe damage to your pet’s paws. Before heading out for a summer stroll with your pet, press the backside of your hand to the ground for at least 7 seconds. If the ground is too hot for you, then it will be too uncomfortable for your pet. One of the benefits of the summertime is later sunsets, which gives you plenty of time to take your pet for a walk when the ground has cooled and temperatures have dropped. If you are spending a day at the park, then you should bring your PET GAZEBO® along with you. The canopy and sun shade protect your pet from the elements, including the sun’s harsh rays. Set it up on the cool grass, so your pet can enjoy the fresh air and time spent alongside their best friend. Advantek Pet is constantly looking out for ways to improve the well-being of your pet. To keep them cool and comfortable in hot weather, we have been developing a pet mister that hooks up directly to your PET GAZEBO®. Depending on the temperature, you can set up the mister to go off at intervals to consistently keep your pet cool. Be on the lookout for this new product, as it will be available in the next 30 days. Check out Facebook page for more information! One of the great things about the PET GAZEBO® is that it can be used outdoors and indoors. If it’s too hot for your pet outside, but they need a comfortable place to relax, then you can also set it up indoors. The PET GAZEBO® keeps your pet safe and is customizable. You can create a play area for your pets to let them have fun while getting some shade. An important piece of advice we can give to pet owners is: keep yourself and your pets hydrated. They should always have cold water by their side and a shady area to relax. Make sure your pet has plenty of food throughout the day and pack snacks or treats if you will be spending more time outdoors. It is also imperative that pet owners stay hydrated and happy as well, so you can take the best care of your pet! Are you interested in ordering a PET GAZEBO® for your pet to keep them safe and comfortable during the summer? Visit petgazebo.com to purchase yours today. Learn more about selling our products in your store by contacting Advantek Pet.